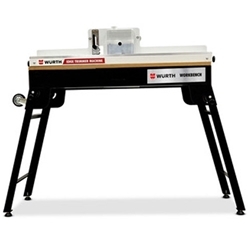 The Wurth Portable Edgbander Workbench is perfect for your cabinet shop or mobile workshop requirements. Your work table is made in MDF with a work area 1.000 x 420 mm (39″ x 16,5″). Its structure is made rigid sheet metal and supports up to 200 kg (441 pounds). This edgebander workbench contains a drawer for the user to store extra trim bits or any other accessories for your projects. In addition, it has 2 electrical plugs and electric extension of 2.000 mm (78,7″). This folding workbench has retractable feet and wheels for transport, enabling the user to take your edgbander trimmer to wherever he wants or into storage.